Outwork’s Speed Will Help in Kentucky Derby 142 by Reinier Macatangay: Todd Pletcher only won the Kentucky Derby (GI) once in his life, in 2010 with Super Saver, despite several tries with various horses. 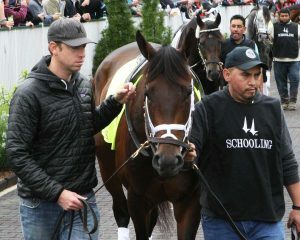 On Saturday, he will attempt to win the race again with Destin and Outwork. Of the two runners, Outwork appears to be the more dangerous threat off his hard-fought Wood Memorial Stakes (GI) victory. Mike Repole owns Outwork, and also campaigned the sire Uncle Mo who was withdrawn from the 2011 Kentucky Derby because of a mysterious liver problem. Uncle Mo’s regular rider John Velazquez will pilot Outwork. Like Uncle Mo, Outwork shows speed in his races. In all four of his starts, Outwork has been first or second at the first call of the race, including in his successful career debut at Keeneland last spring. After winning impressively, Outwork disappeared for a while and returned at Tampa Bay Downs three months ago where he won an optional claiming race by over four lengths. 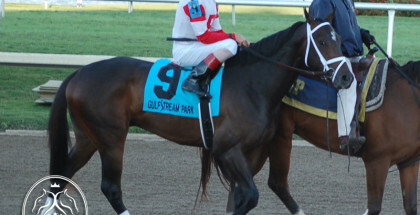 One month later, he competed in the Tampa Bay Derby (GII) against stablemate Destin, and gave up a comfortable lead to lose to him by one length. At least the race went fast (by this year’s standards), as Destin earned a 115 TimeformUS Speed Figure for the win. For comparison, the highest number on the trail was Exaggerator’s 119 in the Santa Anita Derby (GI). Then, Outwork fought off a maiden to win the Wood Memorial at Aqueduct. Yes, everyone focuses on the fact Trojan Nation, who also starts in the Kentucky Derby, is a maiden. Look at how Outwork won though. He contested the pace set by the “need-the-lead” Matt King Coal and ended up as the only pace horse around near the finish line. Matt King Coal faded to fourth place, while the horse chasing in third early on (Flexibility) dropped to seventh and lost by roughly 25 lengths at 6-1 odds. Meanwhile, the maiden Trojan Nation ran up the rail to challenge, but Aqueduct’s rail had been a great spot during the spring and possibly helped him. Even if Trojan Nation had won by a nose, Outwork’s effort would still be ranked higher because he worked harder to establish position, fight off the speed and keep going in the stretch. The difference between the two horses seems clear. Outwork is more talented than Trojan Nation by a couple of lengths at minimum. If one thing can be criticized about the Wood Memorial, Outworked only earned a 106 TimeformUS Speed Figure, which ranks a bit low compared to the average of 115 for the top contenders in their last prep race. For what is is worth, clocker Gary Young offered his opinion on Outwork at Churchill Downs leading up to the Derby, and gave high marks for the April 29 workout in company with Azar. Azar, a one-time winner on dirt, mainly runs on turf and finished runner-up in the Spiral Stakes (GIII) on synthetic to Oscar Nominated. Young continued to praise Outwork later in the week and wrote more kind words on May 2. While the average TimeformUS 106 Speed Figure from the Wood Memorial is a concern, Outwork looks set to fire a career-best effort and is a legitimate threat to win the Kentucky Derby. With a good break, he will establish a perfect forward position, get first run on Danzing Candy and hold off the other challengers in the stretch.